how did you find the Einkorn? It's quite a bitter bread. 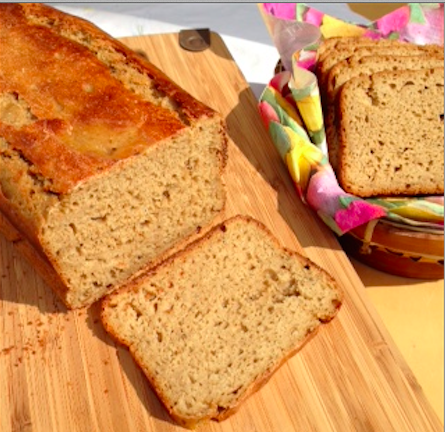 Now that you have baked using Einkorn how would you compare its flavor to spelt? Looks like you got terrific rise in you ceramic baker. I imagine it is delicious. I know when I have made Einkorn rolls people really like the flavor and texture but they don't know how to compare it to spelt flavor etc. Thanks for the post and your photo. and yes, I find it lightly bitter. Very nutty. Well, I did add hazel nuts... I have been using Einkorn in most everything instead of AP flour. Hadn't made a pure loaf of it until today. I prefer Spelt myself. I think the trick with this low gluten flour is to make a 5% water roux. I have been working with this recipe since Thursday. 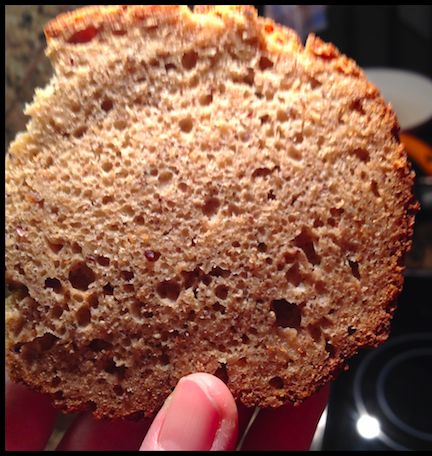 Apparently I had a poorly copied version of Eli Rogosa's method of making Einkorn bread. Her's takes 5 days. I kept extending the two day recipe I was using because it seemed too "unripe." When I found her recipe this evening, there was an "AHA!" moment. I will keep the Einkorn starter going until it IS ready and try again. I had listless sticky firm dough and that's not the way to go with this weak flour. I even found studies where testing was done with 48% hydration because Einkorn absorbs so little water. True but like rye, conventional wheat wisdom is it's doom. "Makes a thick firm dough." (Stay away from those recipes!) I even pinched off a piece of dough and baked it to see if it would spring in the oven. It didn't. Hockey puck all the way, real stick to your ribs type dough. That's when I decided high hydration in the name of water roux (Tangzhong) with malt and bubbling instant yeast was today's solution. (Bob and I have been discussing these low hydration Einkorn doughs and he's had little luck with them.) I now had a thoroughly re-mixed sticky patz that filled the form half full (for the second time.) I quickly placed the top half of the mould over the filled bottom, waited 15 minutes and stuck the form into a 160°C oven with the temperature rising. (Praying and hoping it wouldn't ooze out of the form at the midline.) When it hit 220°C 20 minutes later, I counted off 15 more minutes and lowered the oven to 200°C for the rest of the hour. Pulled it out, took off the top and, Wow, took a picture. Inside temp of 100°C or 212°F. The oven spring had doubled the size of the dough. I will try something closer to this recipe next time. Thanks for details. I like the idea of the roux to assist with getting more water into this grain. The rolls I made were 'dense' for lack of a more appropriate word but in a roll people liked it. Maple syrup was used for the sweetener which probably helped with the bitterness people have mentioned with this grain. For a loaf - too heavy so I have yet to venture into a 100% Einkorn loaf. Due to expense I generally add it as a portion of the flour in one of my ww loaves - 25-40% and it works just fine that way with the wheat to give strength/rise to the final dough. I am used to spelt too as it blends well with the other main grains I use so when my Einkorn gets used up it won't be replaced. that grows on you. Sort of like that first sip of beer. My tongue tingles a little but that might be that crusty crust. It's dark here already but I'll see what I can do about a crumb shot. Still want to bake a choco-cherry cake tonight. It's already 7:30 pm. I like mixing a flat dough with a frothy Tangzhong to get a fast reaction. I'm tempted to try it with other doughs. Autolyse a firm dough for a day or so and have a roux on "standby" then when wanting to bake it in a hurry. (like within an hour or two) Put the 2% instant yeast into the microwave warmed roux, stir in a teaspoon of malt and wait 5 minutes. Pour the frothy roux onto the dough, add salt and squish it in. Shape or throw it into a well greased pan, slash, cover, and into the preheating oven. Could I make starch (total gluten free) rise? Hmmmm. ??? It is bitter. And an Einkorn sourdough is very bitter. It's also makes quite a dense bread. I think if one can find a way to not make it so dense then the bitterness won't be too strong. Spelt is also more dense than modern wheat but such a lovely nutty taste. it is firm, like any regular bread here in Austria made with whole flour. Moist too. Maybe this second photo is better although the top is out of focus. Dolly just loves it and I don't find it too bitter. :) Maybe our local flour had a good year. no denser areas around the perimeter or on the bottom - the spring was really good in the clay baker. Well done and thanks for explanation of your roux, malt (was it white or red malt?) and yeast method. on you there, sorry, but in this photo the same can be said. The bottom is to the left of my thumb and the side to the right. Just ate another naked slice. It's growing on me and I just might go for a beer soon. Just a little one. These crumb shots are always a little clearer when the light is not directly on them and more from the side. Also this slice was cut with a knife and not the electric slicer. Yummy bread. Maybe there is more air in the bread or I'm eating with my mouth open. Lol Can go either sweet toppings or savoury. The malt was the active white barley malt I made way-back-when. I used 5g to 725 g total flour, I was worried the crust would come out too pale and I more or less blended it into the roux with the yeast. That bubbling yeast/roux did lighten up the dough immediately. I was worried I might not get the top on the form before I got the sticky dough off my fingers. is amazing! It took me many attempts to get a crumb that was nearly that good! without your feedback. That's what I love about TFL, bringing the puzzle pieces together or finding new ways to do something. Thank you. its my pleasure, and I look forward to more collaborations in the future with you. and your crumb is great for an 100% Einkorn bread. 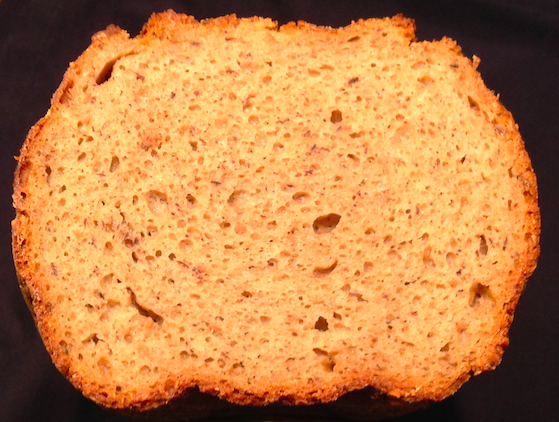 It is much easier to work with a 100% Einkorn or spelt dough, if you add some protein, like yogurt or buttermilk, as I did in my Einkorn Walnut Yogurt Bread. I wonder, though, that you and others find Einkorn bitter, I really like the taste and find it nutty, yes, but not bitter. 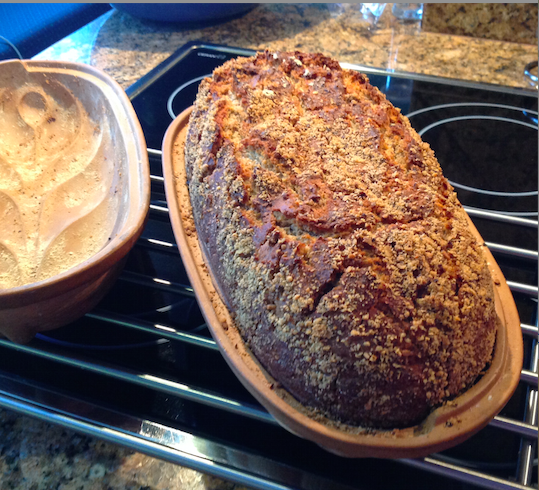 or fermented dairy was not the first option as Bob makes his Einkorn breads without dairy. I can always add some. Right now I want to add chocolate. I used Einkorn in my last chocolate cake and it was so good! Works well with eggs, also protein. Love a fudgy cake. with time. Can't make it out today, one day later. I bagged it overnight to move the moisture to the crust. (edited for clarity, replaced "it" with "bitter." Difficult flour to work with. But it looks absolutely delicious. Freezes nicely. Wrapped and waited a day for the crumb moisture to even out in the crumb, then sliced the loaf and froze most of it. Take out a slice when desired and microwave or thaw out over my hot coffee. Very nice! No traces of any "bitter" that I can find. Keep a lot of bread this way (frozen in zipper bags) makes for quite a selection. I covered them with foil and waiting to see how high they rise and if they ever fall. We all know the IDY will rise the fastest but I really want to know if einkorn falls apart and when it happens. Maybe it takes thousands of years. When is it over-proofed? 1) Control behaved like one, did nothing we could see with the naked eye. no rise or increase in volume in 16 hrs. 3) IDY doubled in 30 minutes, peaked in 4 hours at 2.5 times o.v. and levelled out at the 5th hour. At which it promptly fell 10 minutes later. it was then stirred. 11 hours later it was at double and still domed. 18 hours into the experiment all samples were stirred for thickness, compared with each other for colour and taste. 3) IDY Medium thick paste as thick as control, lighter in colour than the Control but darker than SD sample, taste a little bitter fruity. Conclusions: Einkorn dough raised with einkorn SD culture feels thinner or wetter when fermented than einkorn dough leavened with IDY. 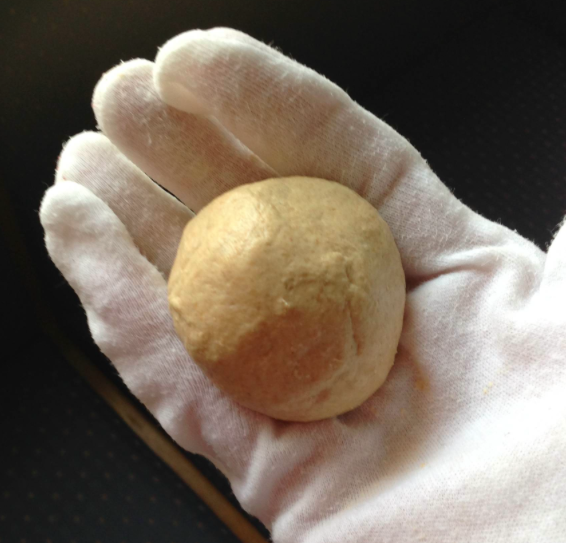 Einkorn dough fermented with IDY is just as thick as einkorn dough without any leaven. Wet wrung out cotton gloves. It's a miracle! Einkorn & Rye or "Yellow Rye"
Whole Einkorn and Rye work very well together. Got a loaf being eaten up as I type. It rose so well it rose into my aluminium foil cover where is stuck quite nicely. (drat) It's the 500g flour recipe I'm playing around with using a 5% water roux. Lovely! In a microwave safe dish, blend 25g of whole Einkorn flour with 125g of water, let rest to hydrate the flour 15 min before heating 3 x 30 sec on high stirring between zaps until just thickened. Let cool. Grease and flour (rye) a bread pan and spoon in dough until half full. Shape and dome with a wet spatula. Let pan stand 10 minutes while you cover with a layer of greased foil ( or use a second pan) leaving plenty of room for a doubling rise. Pop into a hot steamy oven second rack from the bottom, set timer for 1 hour and do something better with your time. I went out into the garden. Brush with boiled water if desired to soften crust. Cool on rack. I used a 2kg pan which is a tad too big for this amount of dough. A smaller pan or more dough will get a taller loaf. 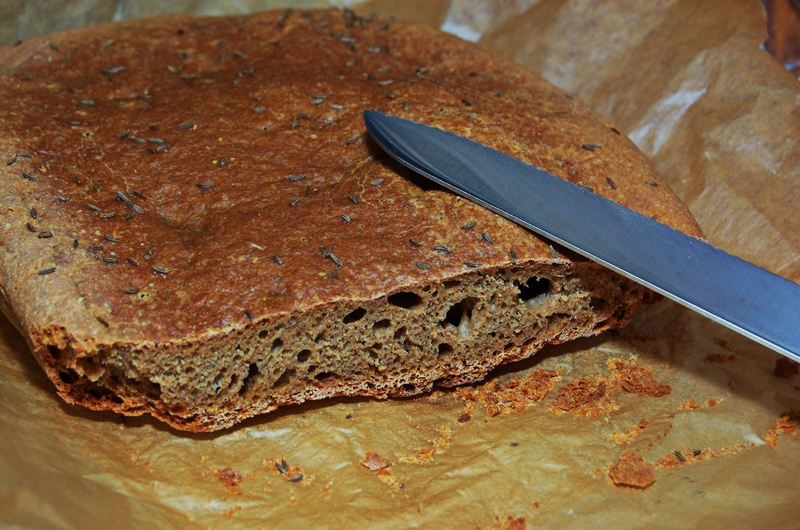 I've only made a 100% Einkorn flour bread once and it was from Doves Farm Organic Wholegrain Einkorn flour. 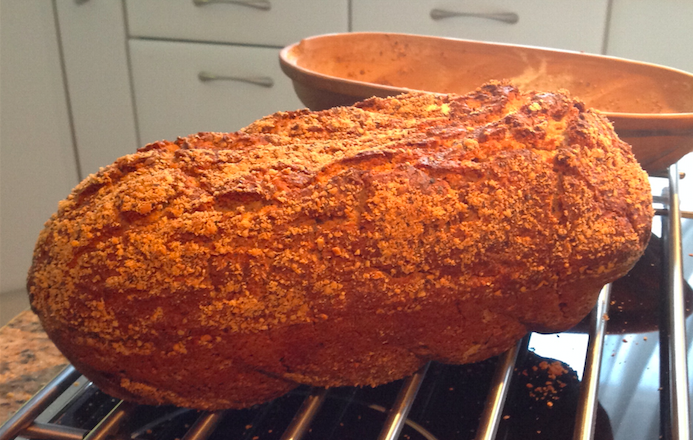 I'd like to do it again, but the flour is a bit too expensive in small quantities (1 kg). Perhaps there's a difference in the milling method or pre-milling phase which neutralizes bitterness in their flour. I put a bunch of starters into deep sleep before heading off to Laos for a year. I took some of the starters with me and I left those in Austria to chance family and the refrigerator. Upon my return, I discovered most of my refrigerator starters unrecognisable. Most were black and covered with mould and strangely squishy instead of firm. I dumped all of them except for two; half of a dry rye ball (hard as a little rock) and an Einkorn starter that might have survived partially the torture and abuse. They were hiding in a compartment with the nail polish. So I did find two of my refrigerator starters still intact after the refrigerator had been off for well over a week. (I will get a confession later.) Strange enough, the two survivors were extremely dry (we're talking prepared as crumbs barely held together by mature starter) and packed in plastic bags. The others had their own single jars, each having a bed of flour and sealed tightly. Right away I suspected a warm spell as all of them were badly deteriorated. The Einkorn starter was prepared Nov 22 of last year. I cut away all the funny outside sections to get at the core and it is soaking in water with a small addition of fresh flour now 12 hrs. The only flour that didn't go rancid was my Einkorn flour packed inside a glass with a tight rubber/glass seal. I'm using it to restart the Einkorn starter and prepare it for another long stint in the refrigerator (hiding with the nail polish.) My whole Einkorn grains are in excellent shape and after soaking some overnight (discarded the water) and cooking them this morning, made a nice sweet breakfast. No bitter, no need for added sugar. The flour on the other hand was not bitter but it stuck to the roof of my mouth like plaster. Must have been very dry. Took a while to work it off. I was in the process of dumping it when I tasted it. My Kamut and Grunkern berries still seem to be in order. I can't say the same for nuts, red rice, the other whole flours & pumpkin seeds. Still wondering about the chia seeds. The popcorn was tasty. The bread cubes made a nice warm fire. Flour by the way, is explosive if thrown into a fire so they went into the composting collection service. The birds are looking over the nuts. overnight in cold water. Drained in the morning and rinsed the whole gran before adding clean water and a pinch of salt. Boiled and simmered until tender. Lovely sweet cereal. I ate with milk but a little cream would be nicer. No sugar needed. No bitterness that I could detect.